You know you’ve entered a new era when Cisco’s latest switches take a backseat to Google at the network-technology giant’s biggest annual conference. To be sure, CEO Chuck Robbins did tout the success Cisco’s been having with its latest Catalyst 9000 switches in his opening keynote at Cisco Live! 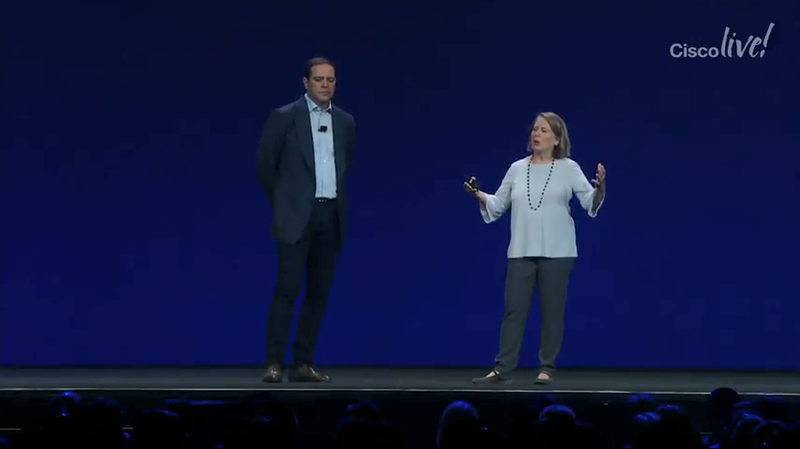 in Orlando Monday – “Catalyst 9000 is the fastest-ramping product in the history of Cisco,” he said – but that came after he brought on stage Google Cloud CEO Diane Greene. Toward the end of last year, Cisco made a partnership with Google Cloud. The two said they’d work together to help enterprise customers build hybrid-cloud environments that are consistent across GCP and customers’ on-premises data centers, enabled primarily by Kubernetes, the Linux-container orchestration platform Google created for its own use about a decade ago and open sourced in 2014. GCP management says it’s made progress in becoming more recognized as a serious player in the enterprise IT space, but it’s been an uphill battle for a company that’s traditionally been more comfortable in meetings with chief marketing officers than with CTOs. A partnership with Cisco, which is ubiquitous in the enterprise IT market, can go a long way in helping Google Cloud achieve its market ambitions. Cisco too has a lot to gain from this collaboration. Like other long-time enterprise tech giants, it’s trying to remake itself from a company whose business depends primarily on hardware sales into one that’s known for its software and services. It’s still far from achieving that goal – more than half its revenue comes from hardware sales – and clearly hopes that leveraging Kubernetes, the hottest thing in enterprise infrastructure software today, will help it get there. Robbins and Greene used the Live! keynote to reaffirm the messaging around the partnership and give a few updates on the progress. The solution they said was slated for release sometime later this year is a hybrid-cloud architecture that combines Cisco’s Kubernetes-based Container Platform, launched in January, with its hyperconverged infrastructure product called HyperFlex, all tightly integrated with GCP. Cisco’s technical support staff will support the joint solution, according to a Google blog post. Greene highlighted Kubernetes’ value to developers and operations and security professionals. It makes developers more productive because they don’t have to think about infrastructure when writing applications, she explained, while operations and security staff have an easier time managing a company’s IT environment because it’s uniform, whether it’s running in the cloud or on-premises. “For security to have one consistent model across everywhere that you’re running, that is huge,” she said. Cisco and Google are facing some heavy competition in the hybrid-cloud space. Amazon Web Services, the world’s biggest cloud provider, has a hybrid-cloud partnership with VMware; and Microsoft Azure, the second-biggest cloud provider, has a strong hybrid-cloud play of its own. Oracle and IBM, both of whom – like Cisco, VMware, and Microsoft – are deeply entrenched in the enterprise, are also going hard after the hybrid-cloud market. The hybrid-cloud angle is important to Cisco, since, as we already mentioned, it still gets a big chunk of its revenue from hardware sales, and enterprise data centers are a major customer segment for that hardware. If the hybrid architecture is here to stay, that business won’t dry up for the foreseeable future. “Investment in private data centers over the last four years has not gone down,” Robbins said in his keynote.